The word baptize comes from the from the Greek word βάπτειν, which means "to immerse". For two thousand years, Christians have been immersed in water to demonstrate their obedience to the words of Jesus, who instructed his followers to be baptized "in the name of the Father and of the Son and of the Holy Spirit." The Bible records that the apostles baptized all new converts in the name of Jesus Christ. Baptism symbolizes a Christian's participation in Jesus' death, burial, and resurrection. It demonstrates submission to the teachings of Jesus Christ, and is also an acceptance of the promise of eternal life. 1 Why must Christians be Baptized? 2 Should Christians be Immersed? 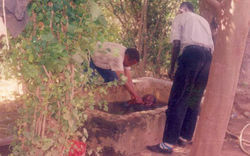 3 In what Name should Christians be baptized? 4 Is baptism required for salvation? 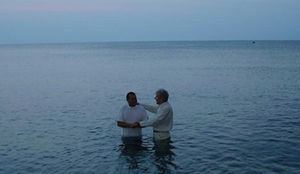 Baptism in the Black Sea, Ukraine. The Apostle Peter said this doctrine was applicable to all Christians - in every century. While Christians believe that baptism is a very important practice, they hold that it is by faith alone that a person is justified. At the same time, while this ordinance is not a requirement for salvation, the New Testament does give the impression that an unbaptized Christian is not to be the norm since the rite is a means of identifying with the death and resurrection of Christ. Every Christian ought to be water baptized as long as it’s understood that this is not a work the person is doing to somehow qualify for justification in God’s sight. Baptism is identification with the death, burial and resurrection of Jesus Christ. Immersion in a Philippine Jail. Full Immersion is the preferred Biblical method of Baptism. The Greek word for baptize (βάπτειν) means to fully immerse something in a fluid. Vine's Expository Dictionary of New Testament Words states that the word is derived from bapto, meaning to dip, and was used among the Greeks to signify the dyeing of a garment, or the drawing of water by dipping a vessel into another. Vine's also sets forth the noun form as follows: "baptisma ... baptism, consisting of the process of immersion, submersion and emergence (from bapto, to dip)." The fact that baptism is to be by full immersion is further validated by its being likened biblically to a burial. In what Name should Christians be baptized? Christians should be baptized in the name of Jesus Christ or in the name of the Father, and of the Son, and of the Holy Ghost, provided that it is made clear that the person is doing this on the basis that they have believed on Jesus Christ for the remission of their sins. The reason that baptisms in the Book of Acts were "in the name of Jesus" is not because it was a formula, but because being baptized “into” (εἰς, eis) the name denotes incorporation into the Lord and his community, declaring one’s allegiance and implying the Lord’s ownership. After making Peter and John stand in their midst, they began to inquire, “By what power or by what name did you do this?” Then Peter, filled with the Holy Spirit, replied, “Rulers of the people and elders, if we are being examined today for a good deed done to a sick man—by what means this man was healed— 10 let it be known to all of you and to all the people of Israel that by the name of Jesus Christ the Nazarene whom you crucified, whom God raised from the dead, this man stands before you healthy. So "in Jesus' name" is not a magical formula for what must be specifically stated when baptizing a person. "In Jesus' name" simply means by Jesus' authority or power. To baptize in Jesus' name simply means to do so in obedience to His power or authority. His authority is the authority of God , which is the same power as that referred to in Matthew 28:19 - the name of the Father, and the Son, and the Holy Spirit. So to baptize in accordance with Jesus' name is to baptize according to His power or authority, which is the same as baptizing according to the name or authority or power of the Father, Son and Holy Spirit. Either formula would appear to be acceptable from scripture. When the apostles in Jerusalem heard that Samaria had accepted the word of God, they sent Peter and John to Samaria. 15 When they arrived, they prayed for the new believers there that they might receive the Holy Spirit, because the Holy Spirit had not yet come on any of them; they had simply been baptized in the name of the Lord Jesus. Then Peter and John placed their hands on them, and they received the Holy Spirit. Given the promise that those who repent and are baptized in the name of Jesus Christ will have their sins forgiven and receive the gift of the Holy Spirit (Acts 2:38–39), are we to conclude that there was something deficient in the faith of the Samaritans? Luke seems to be at pains to stress the orthodoxy of Philip’s preaching, the close attention paid by the Samaritans to what they heard, and the genuineness of their response (Acts 8:5–6, 12; contrast the ‘disciples’ in Acts 19:1–5). Was it because there were no apostles present? Luke later makes it clear that the Spirit can be given when the person baptizing is not an apostle (Acts 9:17–18). Was it because they needed to receive the Spirit in a fuller sense, for inspiration, or for the reception of charismatic gifts? Was it because they specifically needed the Spirit to be given to them in this way to empower them for mission? The idea that they needed more of the Spirit is ruled out by Luke’s insistence that the Holy Spirit had not yet come upon any of them. With the words not yet (oudepō), Luke indicates that the Samaritan incident provides ‘a clear break with the “norm” we might expect from Acts 2:38–39. The best explanation is that God himself withheld the Spirit until the coming of Peter and John, in order that the Samaritans might be seen to be fully incorporated into the community of Jerusalem Christians who had received the Spirit at Pentecost. The apostles simply needed to be there as reliable witnesses on behalf of the Jerusalem church, not to impart the Spirit because of their office. Significantly, in Acts 8:25 they return to Jerusalem to report what God has been doing. The delay in the sending of the Spirit put the Samaritans somewhat in the position of the Jewish disciples before Pentecost. They had a genuine faith in the risen Lord, but had not yet received the promised Holy Spirit. Neither the experience of those first disciples nor the experience of the Samaritans can be made the basis for a two-stage view of Christian initiation, in the two-stage view of salvation in the Pentecostal sense. William Branham's insistence that as long as someone is baptized "in the name of the Lord Jesus Christ" they are entitled to receive the baptism of the Holy Spirit does not work here either. These were unique events in salvation history, not the normal pattern of salvation known to Luke. Baptism is the immersion in water of a believer in Jesus Christ performed once as the initiation of the believer into a community of believers, the church. Baptism signifies the believer’s confidence that Christ’s work was complete for his forgiveness and justification and indicates his desire for unity with the church, Christ’s community of the new covenant, purchased at the price of his blood. Salvation does not derive from the act of baptism itself. The person baptized has no scriptural warrant to believe that, in baptism, Christ’s saving activity is initiated, augmented, or completed. In its symbolism, however, it sets forth the saving gospel of Christ both in its objective and subjective aspects. It pictures the historical event in the life of Christ that brought to fruition the purpose of his incarnation, namely, to give his life as a ransom for many. It pictures the believer’s conscientious testimony that Christ’s acceptable sacrifice alone allows a sinner to approach God in the confidence of being accepted. It pictures the present experience of the believer in his awareness that when he was dead in trespasses and sins, God “made [him] alive with Christ” (Eph. 2:5) by the powerful operations of the Holy Spirit. The power that is necessary to produce this change is “like the working of his mighty strength, which he exerted in Christ when he raised him from the dead and seated him at his right hand in the heavenly realms, far above all rule and authority, power and dominion, and every title that can be given” (Eph. 1:19–21). ↑ Bill McKeever and Eric Johnson, Answering Mormons’ Questions: Ready Responses for Inquiring Latter-Day Saints (Grand Rapids, MI: Kregel Publications, 2013), 167. ↑ Darrell L. Bock, Acts, Baker Exegetical Commentary on the New Testament (Grand Rapids, MI: Baker Academic, 2007), 331. ↑ The New International Version (Grand Rapids, MI: Zondervan, 2011), Ac 8:14–17. ↑ David G. Peterson, The Acts of the Apostles, The Pillar New Testament Commentary (Grand Rapids, MI; Nottingham, England: William B. Eerdmans Publishing Company, 2009), 286–287. ↑ Thomas J. Nettles, Baptist View: Baptism as a Symbol of Christ’s Saving Work, ed. John H. Armstrong and Paul E. Engle, Understanding Four Views on Baptism, Zondervan Counterpoints Collection (Grand Rapids, MI: Zondervan, 2007), 25–26. This page was last edited on 24 June 2018, at 15:08.